Abstract: The KM18G Pro v2.0 supports current 200/266/333 MHz FSB based AthlonXP processors and can be used with a maximum of 3GB of PC1600/2100/2700/3200 DDR RAM. It's funny that while the SFF fad is in style not many manufacturers have a micro ATX nForce2 motherboard in their lineup. Albatron do, and have just released their KM18G Pro V2.0 nForce2 IGP based motherboard which could easily become the backbone of a home theatre PC. Of course just because the motherboard is small in size does not mean it will not be just as good for everyday computing... or does it? Only the benchmarks will tell us where the KM18G Pro V2.0 really stands, so let's get started. With a retail price of $170 CDN ($105 US) the Albatron KM18G Pro v2.0 is a little on the pricey side, but then again smaller sized components have always costed more. The KM18G Pro v2.0 supports current 200/266/333 MHz FSB based AthlonXP processors and can be used with a maximum of 3GB of PC1600/2100/2700/3200 DDR RAM. Because of the relative small size, the only "frills" of the motherboard are its 10/100 LAN, integrated video & TV-out, and 5.1 audio. So what makes a small micro-ATX motherboard such as this worth checking out? Well, while I still like my computers big, loud and powerful, I understand that not everyone wants or needs that. My sister for instance uses her PC mainly to write essays for school and surf the internet. She could have easily gone with something that's less expandable then her current Asus A7V333, and that takes up less space. The Albatron KM18G Pro is a pretty small motherboard with the dimensions of 244 x 244mm. It seems like Albatron likes the blue coloured PCB's as most of their motherboards and videocards use it. Despite not having a lot of room to work with the Albatron engineers did a pretty decent job with the layout of the KM18G Pro. 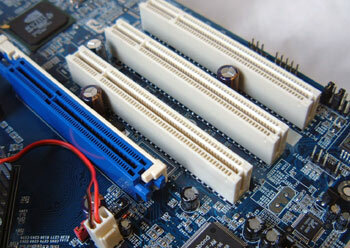 The floppy/IDE connectors are in the the ideal location to the right of the DIMM slots. Because most smaller ATX/Micro ATX cases are quite cramped and because the nForce2 Northbridge gets quite hot, Albatron took it upon themselves to use an active cooler. The KM18G Pro is well labelled and so you'll know exactly what a header/jumper does by simply looking on the PCB. 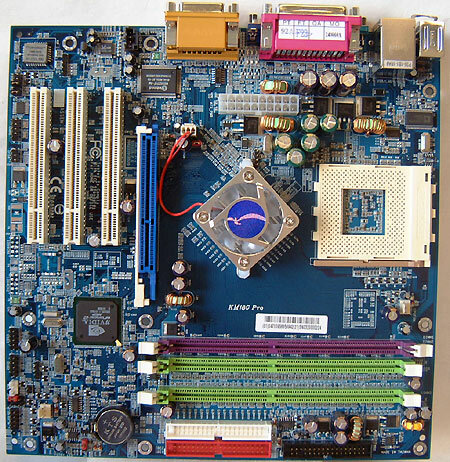 Albatron made things easy on the end user by placing all the headers (USB 2.0, Com2, IrDA, etc) at the bottom of the motherboard. This way they will not interfere with the other installed PCI/AGP peripherals. The AGP lock that Albatron chooses to employ is much stronger then the average clip type lock and your AGP videocard will certainly not come of of the slot once it's installed. To be honest there isn't much to complain about with the KM18G Pro motherboard once you realize it's intended purpose. Even though there's not much room, I would have liked to see Albatron sneak in one or two Serial ATA ports since it's obvious that Serial ATA is the way of the future. Pg 7. Small and beautiful?